Larry Willoughby Collection, Courtesy of Huey Meaux. BROWN, CLARENCE [GATEMOUTH] (1924–2005). A multi-faceted musician whose eclectic tastes reflected the great diversity of musical styles found throughout the Southwest, Clarence “Gatemouth” Brown was born in Vinton, Louisiana, on April 18, 1924. Brown’s father, who was one of his strongest musical influences and taught young Clarence to play piano, fiddle, and guitar, was a railroad worker and a local musician who played country, Cajun, and bluegrass. 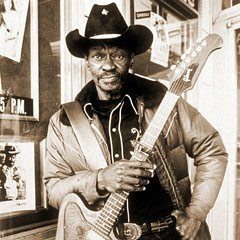 Throughout his career, Gatemouth Brown performed a variety of musical styles on a broad array of instruments, including guitar, fiddle, piano, drums, mandolin, harmonica, and viola. As a youth who grew up in Southeast Texas near Orange, Brown absorbed the country, bluegrass, R&B, Czech and German polka, Cajun, and early jazz and swing that could be heard throughout the Texas-Louisiana border region. By the time he was five years old, he had learned to play fiddle, and by age ten he was performing on guitar. By the time he was a teenager, Brown played the drums in territory swing bands where he was given the nickname “Gatemouth” because of his deep voice. Photograph, Picture of Clarence "Gatemouth" Brown in action. Image available on the Internet and included in accordance with Title 17 U.S.C. Section 107. By the late 1950s Brown had become frustrated with the limitations of being strictly a blues and R&B musician and decided to finally part ways with Robey and Peacock Records by 1961. However, throughout the 1960s Brown had difficulty finding other work as a musician, something he blamed in part on his strained relations with the influential Robey. During this period, Brown held a variety of jobs. He worked as bandleader on the Dallas syndicated R&B television show The !!!! Beat in 1966. In the late 1960s he was a deputy sheriff in New Mexico. At one point he moved to Nashville where he appeared a few times on the popular country music television show Hee Haw. It was also in Nashville that Brown released his first series of country singles. He later recorded a well-received album, Makin’ Music, with Roy Clark in 1979. In the 1970s Brown was able to restart his career, this time performing the broad range of styles for which he would become famous, including country, jazz, and Cajun, as well as the blues and R&B he had played earlier. Brown also began touring again, not only throughout the United States, but also in Europe and around the world. On several stints he toured as a music ambassador for the United States State Department. 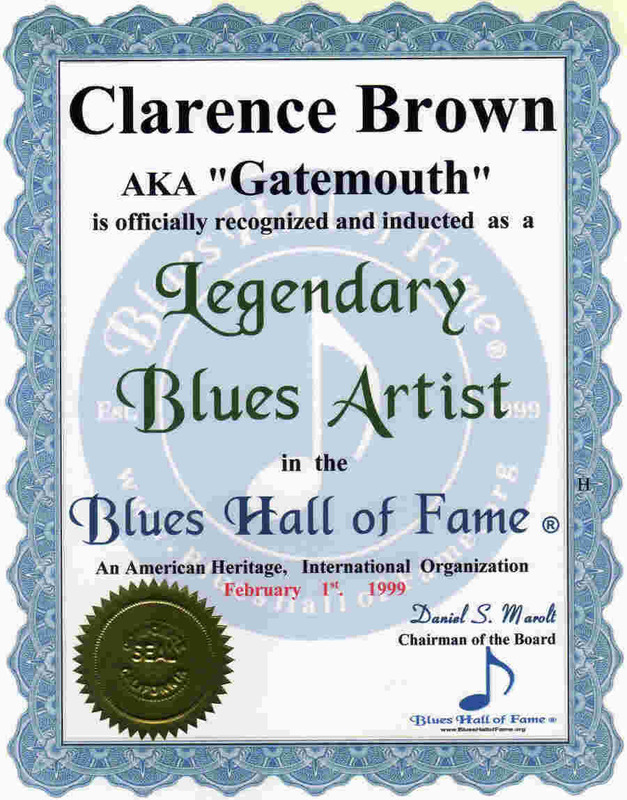 Blues Hall of Fame certificate for Clarence "Gatemouth" Brown. Image available on the Internet and included in accordance with Title 17 U.S.C. Section 107. During the late 1970s Brown signed with Real Records, and by the 1980s he was enjoying success recording for both Alligator and Rounder Records. In 1982 Brown’s Alright Again received a Grammy for Best Traditional Blues Album. He also appeared several times on the PBS television series Austin City Limits. Brown’s second release through Rounder Records, One More Mile (1982), along with the rerelease of his earlier Peacock recordings, brought him more acclaim. Brown won eight W. C. Handy Awards. He received the Rhythm and Blues Foundation’s Pioneer Award in 1997 and was inducted into the Blues Foundation Hall of Fame in 1999. Brown’s independent spirit and eclectic repertoire influenced a variety of other musicians, including Guitar Slim, Albert Collins, Johnny “Guitar” Watson, Jimi Hendrix, Buddy Guy, and Stevie Ray Vaughan. Brown’s wide-ranging tastes also helped broaden the parameters of blues music and redefine the entire blues repertoire. Photograph, Picture of Clarence "Gatemouth" Brown in his later career. Courtesy of Alligator Records. Image available on the Internet and included in accordance with Title 17 U.S.C. Section 107. In the summer of 2004 Brown was diagnosed with lung cancer. Since he was given only a 15 percent chance to survive after chemotherapy, he decided against treatment. His final album, Timeless, was released on the Hightone label in 2004. Despite failing health, Brown continued to perform at various festivals, including the New Orleans Jazz and Heritage Festival in April 2005. After being displaced by Hurricane Katrina, he died at his brother’s home in Orange, Texas, on September 10, 2005. Brown was given a military funeral due to his honorable discharge following World War II, and he was laid to rest at the Hollywood Cemetery in Orange, Texas. During his lifetime, Brown had married and divorced three times. His survivors included four children, Renee, Ursula, Celeste, and Dwayne. Brown is honored as a music legend in the Museum of the Gulf Coast’s Music Hall of Fame in Port Arthur. A Texas Historical Marker honoring Brown was dedicated at his gravesite in 2012. All About Jazz, “Clarence ‘Gatemouth’ Brown” (http://musicians.allaboutjazz.com/clarencegatemouthbrown), accessed September 16, 2015. Austin American–Statesman, September 11, 13, 2005. Peter Dean, “Clarence ‘Gatemouth’ Brown” (www.rhythmandtheblues.org.uk/artists/gatemouth.shtml), accessed November 6, 2007. 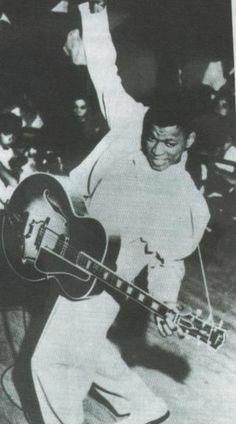 Ronnie D. Lankford, Jr, “Clarence ’Gatemouth’ Brown” (http://www.musicianguide.com/biographies/1608004769/Clarence-Gatemouth-Brown.html), accessed September 16, 2015. Bill Wyman, Bill Wyman’s Blues Odyssey: A Journey to Music’s Heart & Soul (New York: DK Publishing, 2001). Handbook of Texas Online, Erinn Park, "BROWN, CLARENCE [GATEMOUTH]," accessed April 18, 2019, http://www.tshaonline.org/handbook/online/articles/fbrep. Uploaded on May 28, 2013. Modified on September 26, 2016. Published by the Texas State Historical Association.